LL Cool J received Hollywood’s biggest honor by snagging a star on the Hollywood Walk Of Fame. The rapper is being lauded for his career accolades, including being one of the first rappers to sell 10 consecutive platinum plus selling albums, the Los Angeles Times reports. Queen Latifah and Sean ‘P Diddy’ Combs were in attendance speaking during the ceremony about what the actor/rapper’s career has meant to the entertainment industry. Other notable attendees included Mike Tyson, Russell Simmons and Magic Johnson. Following the announcement that police officer Darren Wilson would not be indicted for the murder of Michael Brown in Ferguson, MO, several human rights groups have sprung into action to protest the decision and push back against undue violence at the hands of police. In the entertainment community, Blackout for Human Rights, a “network of concerned citizens who commit their resources to immediately address the staggering level of human rights violations against fellow Americans,” has been active in the past few months with a series of videos calling for a nationwide boycott of all major retailers this Black Friday, the major shopping day following Thanksgiving. One hope is that pressure from the community will cause Wilson to be held accountable at a federal level. To watch the first few videos, click here. NEW YORK (AP) — A group of young people at a New York City jail complex got some words of encouragement on Thursday from hip-hop mogul Russell Simmons and actor/rapper LL Cool J. The two visited Rikers Island to mark the launch of a national anti-violence program from Simmons’ RushCard, a prepaid debit card. 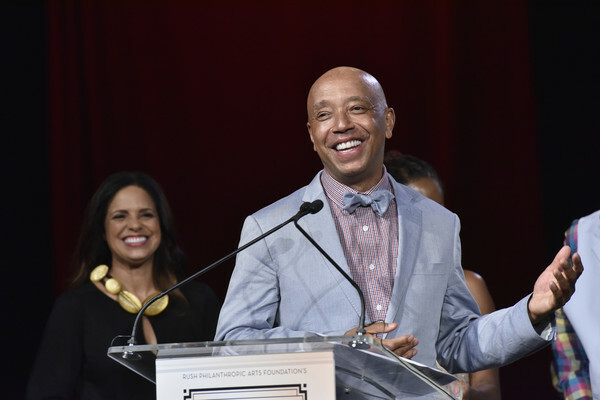 RushCard’s Keep the Peace initiative is giving grants to neighborhood organizations. One of those is LIFE Camp, a Queens organization that works with young people, including those at Rikers, to reduce violence. Cool J told the audience that his rough upbringing could have had him where they are if things had worked out differently, and he encouraged them to believe in themselves. “You can absolutely without a doubt do anything you put your mind to,” he said. Simmons told them to focus on what’s inside them. “It’s your spirit you’ve got to work on,” he said. “We’re trying to encourage them not to come back into the system, hoping they will integrate into society and become contributing members of their community,” he said.